Man Accuses Facebook Of Violating US Constitution, Doesn't Actually Understand US Constitution [VIDEO] - Joe.My.God. “The Constitution of the United States, and the First Amendment says ‘Congress shall make no law respecting an establishment of religion nor prohibiting the free exercise thereof. Nor will they abridge the freedom of speech, of the press’. 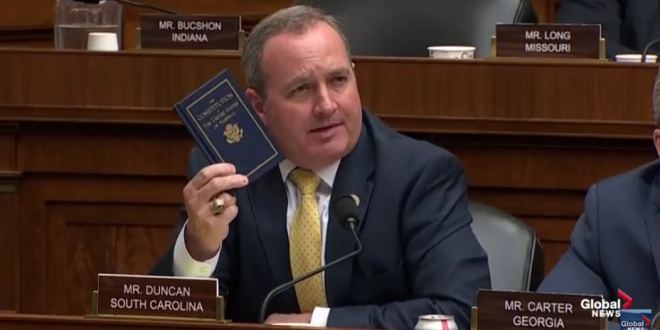 I’ve got a copy of the Constitution I want to give you — at the end of this hearing.” – South Carolina GOP Rep. Jeff Duncan, accusing Mark Zuckerberg of violating Christians’ freedom of speech on Facebook and once again demonstrating that many right wingers are utterly incapable of comprehending the very document they literally, in this case, are waving in your face. VIDEO: Duncan’s transparent attempt at viral fame happens at the very end of the now-concluded live stream below.